Formally declared candidacy April 25, 2007. John McCain was a prisoner of war in North Vietnam when he had an experience of religious affirmation he would recount many years later. One night, after his captors had painfully bound McCain, a guard entered his room and silently loosened the ropes that pinned his head between his legs. Some months later, on Christmas Day, the same guard approached McCain in a courtyard during a short reprieve from solitary confinement. The guard drew a cross in the dirt and looked at McCain without uttering a word. Then, after rubbing away the cross with his sandal, the guard walked away. It is a story that succinctly combines the narrative of McCain’s wartime imprisonment with a commitment to faith that appeals to many American voters. According to an August 2008 survey by the Pew Forum on Religion & Public Life and the Pew Research Center for the People & the Press, more than seven-in-ten Americans (72%) agree it is important that a president have strong religious beliefs; this is virtually unchanged from recent years. Republicans especially are likely to say they completely agree with this view (45%); by comparison, slightly more than one-in-four Democrats (27%) and independents (27%) completely agree. In recent presidential elections, more religiously observant Americans (as measured by frequency of worship service attendance) have tended to vote Republican in larger numbers than their less observant counterparts. In addition, Republican candidates have fared particularly well among white evangelical Protestants, who constitute about one-fourth of the electorate. George W. Bush, for example, received 78% of the white evangelical vote in 2004, up from 68% in 2000, according to a Pew Research Center analysis. McCain’s surprise choice of Alaska Gov. Sarah Palin, a self-described “Bible-believing Christian” with ties to Pentecostal and evangelical churches, as his 2008 vice-presidential running mate was extremely popular among white evangelicals. During the 2008 presidential horserace, McCain’s Democratic opponent, president-elect Sen. Barack Obama, showed he was far more willing to speak publicly about his faith and the positive impact religion can have on public life than was the 2004 Democratic candidate, Sen. John Kerry of Massachusetts. At the same time, McCain appeared less comfortable talking publicly about faith than was George W. Bush, who made religious language a hallmark of his campaigns and presidency. McCain speaks during a town hall meeting at his alma mater, Episcopal High School, in Alexandria, Va.
As in his politics, McCain is something of a maverick in his personal faith, charting his own unique path between two denominations: the Episcopal Church, a mainline Protestant denomination and branch of the worldwide Anglican Communion, and the evangelical Southern Baptist Convention, the country’s largest Protestant denomination. While McCain was raised an Episcopalian, he and his family have been attending a Southern Baptist megachurch in Arizona for years. In the course of his 2008 campaign for president, McCain appeared to be well aware of the importance of religion to many American voters. His website included a video clip titled “Faith” in which he elaborated on his beliefs and sense of purpose, alluding to his imprisonment in Vietnam. 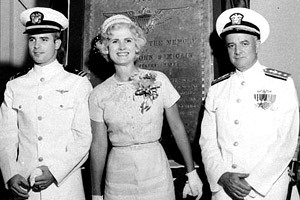 John McCain, left, stands with his parents in front of a plaque at McCain Field, a U.S. Navy training base named in honor of Admiral John Sidney McCain, the grandfather of the candidate. As a military family, the McCains moved frequently. When he was transferred to Long Beach, Calif., McCain’s father told a Catholic school monsignor that his family would convert to Catholicism if that was necessary for McCain to be accepted as a student. But McCain was accepted without converting and remained an Episcopalian. 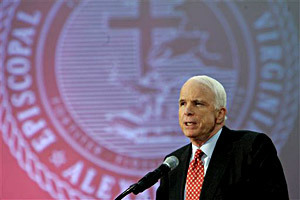 When McCain attended Episcopal High School, an elite, all-boys, preparatory boarding school in Alexandria, Va., he was required to attend daily chapel services as well as Sunday church services, where he frequently recited the Apostles’ Creed and Nicene Creed (historical statements of Christian faith and doctrine). McCain graduated in 1954 and became a cadet at the U.S. Naval Academy in Annapolis, Md., where again he was required to attend chapel. He graduated in 1958 and embarked on a 22-year career as a naval aviator. 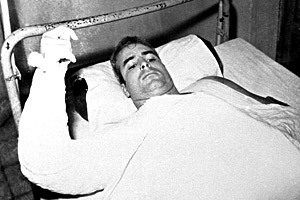 McCain lies injured during his captivity in North Vietnam. As a 31-year-old Navy lieutenant commander in the Vietnam War, McCain was severely injured and subsequently captured and tortured by North Vietnamese forces. McCain often refers to this experience as a time that reinforced his faith in God, his country and his fellow prisoners, renewing his sense of purpose. McCain was eventually released in 1973, nearly six years after he was taken captive, and returned to the U.S. to continue his naval career. After his 14-year marriage to Carol McCain ended, McCain married Cindy Hensleyin 1980. The couple moved to Arizona, where McCain was elected in 1982 to the U.S. Congress, first as a representative and then as a senator. In the early 1990s, the McCains and their children began attending services at North Phoenix Baptist Church. Southern Baptists emphasize adult baptism as a symbol of faith in Christ, and McCain has said that his wife and two of their seven children have been baptized, but he has not. Responding to questions from a reporter in April 2008, McCain called his decision about baptism a “personal thing,” adding on another occasion that “I didn’t find it necessary to do so for my spiritual needs.” But he also has said that he has been in discussion with his pastor, Dan Yeary, about being baptized, adding that he would not do it during the campaign because it might appear insincere. My friends, I am a Reagan Republican who will defeat Al Gore. Unfortunately, Gov. Bush is a Pat Robertson Republican who will lose to Al Gore. I recognize and celebrate that our country is founded upon Judeo-Christian values, and I have pledged my life to defend America and all her values, the values that have made us the noblest experiment in history. … But political intolerance by any political party is neither a Judeo-Christian nor an American value. The political tactics of division and slander are not our values. … They are corrupting influences on religion and politics, and those who practice them in the name of religion or in the name of the Republican Party or in the name of America shame our faith, our party and our country. 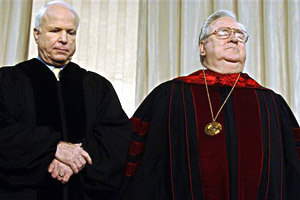 McCain, left, gave the 2006 commencement address at Liberty University, founded by the Rev. Jerry Falwell, right. On the day after this fiery speech, while conversing with reporters on his campaign bus, McCain was asked to elaborate on his comments regarding Robertson and Falwell. This time he criticized “the evil influence that they exercise over the Republican Party,” a remark for which he later apologized. McCain lost the Virginia primary to Bush, and he withdrew his national candidacy nine days later. Since then, McCain has tried to improve his relationship with religious conservatives while also emphasizing the positive role religion can play in public life. In May 2006 he gave the commencement address at Falwell’s Liberty University, which was seen as a significant overture toward religious conservatives. This religious biography was researched and written by Anne Farris, a Washington-based journalist, and Mark O’Keefe, Associate Director, Web Editorial, Pew Forum on Religion & Public Life.